From now on, you can deposit USD and GBP in your CoinDeal’s wallet! It is the second and third fiat currency with which you can enter our cryptocurrency exchange platform. From the beginning, we were trying to show the society of cryptocurrency that we can handle the problems that other cryptocurrency exchange platforms face. That’s why one of our priority tasks was to enable our users to enter our exchange platform with fiat currencies. Consequently, EUR was a first fiat cryptocurrency with which you could start trading. We also paired it with BTC. As the first step, we start with introducing the possibility of making deposits of USD and GBP on your CoinDeal’s account. All you have to do is go to “deposit” tab, choose USD or GBP and do money transfer via Epay. 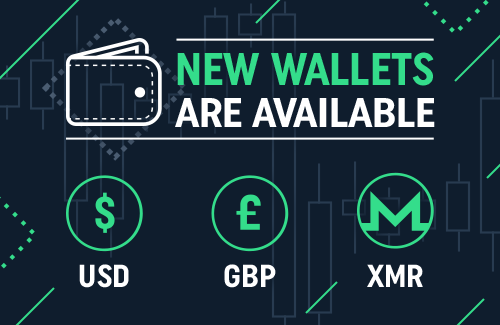 Soon, we are going to introduce the BTC/USD and BTC/GBP markets so everyone will be able to start trading on CoinDeal with dollars or pound sterling. We also add new wallet of Monero (XMR), on which you can deposit and withdraw your funds. • Monero has now its own wallet to deposit or withdraw funds. Don’t wait, prepare your CoinDeal’s wallet for that occasion!